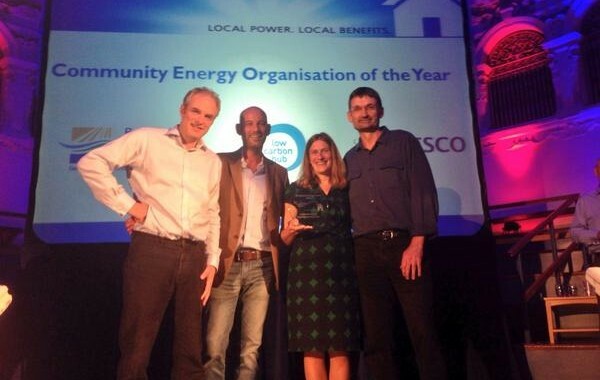 Congratulations to Bath and West Community Energy in fighting off strong national competition to win the ”UK Community Energy Organisation of the Year” Award . Peter Capener, was named ‘Leader of the Year’ for his work as Chair of BWCE and supporting development of the national government’s Community Energy Strategy. The awards were presented on September 4th in Oxford, the photo above shows Chris Crookall Fallon BWCE non-executive director, Jason Sharp MD of OVO Energy(presenting the award), Cathy Hough BWCE non-executive director BWCE and Pete Capener chair BWCE receiving the award. Posted in Bath and West Community Energy, Energy.